Seche Vite Top Coat - At first I thought I was idiotic for paying $10 for a top coat but after using it twice, I am hooked. It keeps my nails glossy and my polish sticks around for an average of a week with minimal wear. This definitely helps the drying time as well which is incredibly important for me because I can't sit still without doing anything for a very short period of time. Sephora By OPI Nail Polishes - I have raved about these many times and you can see some swatches of these if you look through my past nail posts. The colors are very unique and the pigmentation is exceptional. The wear time lasts about a week which is good enough for me. My only gripe is that the price is high for such small bottles but it takes me awhile to get through a bottle of polish anyway so it's a small negative. Milani HD Concealer Pen - I owned this concealer for more than a year but hated it every time I used it as concealer. It's somewhat dry and the pigmentation does nothing for my acne scars. In an effort to shop my stash and use up products I hate I grabbed this and applied the product all over my face and blended out with a brush. Who knew that it'd actually work pretty darn well as an all over base? I haven't been wearing foundation or tinted moisturizer for the past few weeks and this has been the substitute. It evens out my skin tone and holds up well throughout the day. However, I wouldn't buy this again because it comes with a very small amount of product (almost anything in clicky-pen form contains very little product) and it isn't a mind blowing good product. Maybelline Natural Smokes Quad - An oldie but a goodie. I have had this in my collection for ages and it's always one that I reach for. Every single color is a favorite of mine and I have recently been using all four for my daily makeup look. If you don't own this already, go out and get it now! Illamasqua Cream Blush in Rude - I recently posted a full review of this blush so click the link to find that review (or just scroll down I suppose). This is incredibly easy to use and natural on the skin. This is definitely going to be one of those "go to" blushes whenever I am going for a warm toned look. Rosebud Salve - This was a neglected product that I rediscovered thanks to the drying winter air. My lips are very sensitive and are usually chapped and flaky during the colder months. Applying this every night before bed protects my lips so that I wake up with comfortable feeling lips. Ecotools Brushes - I love all my Ecotools brushes but the ones that have really stood out recently are the blush brush from the mineral brush set and the pointed kabuki from the limited edition mini kabuki set. Both apply product flawlessly and are super soft to the touch. I wish Ecotools had a more extensive permanent line of products as they are an amazing brand of affordable brushes. Thayers Lavender Witch Hazel - I was hesitant to try witch hazel for a long time because Dickinson's contains copious amounts of alcohol in their inexpensive formula. 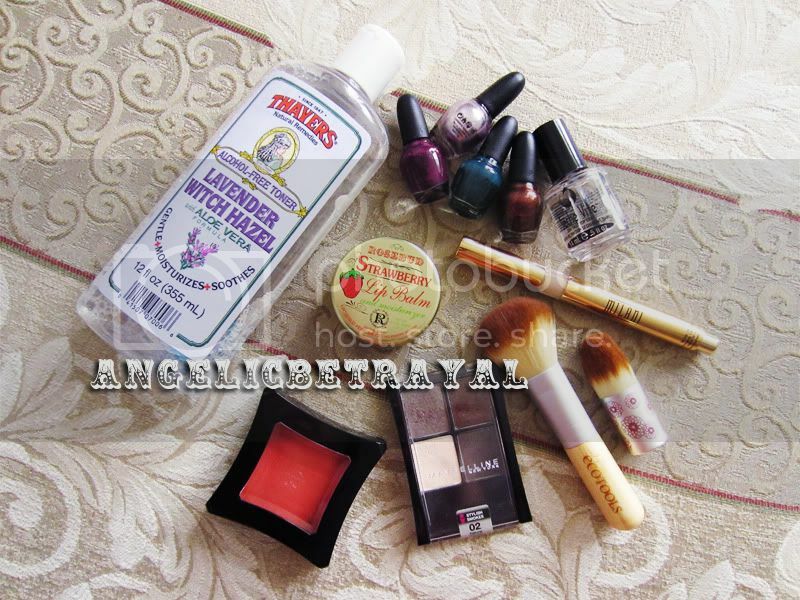 Thayers is pricier but also alcohol free and therefore gentle and non-irritating. While I can never really judge if a toner is doing anything for my skin at all, I have had fewer breakouts recently and I believe this has helped with that. The Illamasqua cream blush really does look nice! :D I wish I painted my nails bc their colors really are nice indeed and there are so many! Every time I go into Sephora, the OPI nail polish section always has such a huge crowd hahaha. Do they still sell the stylish smokes quads? The illamasqua nail polishes DO look really nice! But they're $14 so they're a bit of an investment :( && yes they still sell the stylish smokes quads but they're repackaged so they look a bit different. The pans are oriented differently now but most of the shades are identical to the originals. I'm not sure if the formulas are different but let's hope they're the same! Nice favorites! I really like the seche vite top coat too. Sure speed up drying time, which helps a lot for me as well. Im still drooling over that Illamasqua blush. I have been hauling so much in the past couple months that I really need to slow down the roll. You should definitely try out the Illamasqua blush sometime! Perhaps try to not haul for a certain amount of time and then take the plunge and reward yourself with some Illamasqua :) Project 10 Pans and stuff like that are pretty motivating! Im a Sech Vite whore. LOL. I have a HUGE bottle of it that I use to refill my reg size bottles. Hahaha, that's hilarious :D Where do you buy your Seche Vite from? The limited edition kabuki brush set from ecotools is a must have, I really like them so much that I recommended them to my younger sister, who was happy to purchase them as well. Seche Vite is also a favorite of mine, definitely love how quickly it dries. Glad that you and your sister were able to snag yourselves some Ecotools! It's really frustrating when companies come out with great products but make them LE.